In the West over 40% of our calories come from processed and hard fats. This high intake of potentially harmful fats leads to many degenerative diseases. However a low fat diet also produces health problems such as stunted growth in children, dry skin, low energy, high serum triglyceride in the blood and high cholesterol. Sometimes the immune system is weakened leading to a greater incidence of allergies, leaky gut syndrome and lowered testosterone production. When low fat foods are manufactured they are often high in sugar to compensate for their tasteless nature. This sugar similarly is converted into harmful fat. Fats are made harmful by the process of hydrogenation. Also avoid any fats which are refined, deodorized and/or deep fried. 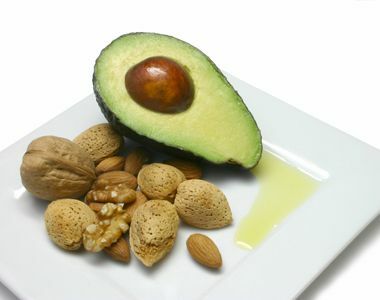 Good non-hydrogenated fats/oils are rich in essential fatty acids. These have many very useful benefits for the body including assisting brain function and strengthening the immune system. There are also minor ingredients present in healthy oils which are so called because they are occur in very small quantities in seeds, nuts and unrefined oils (about 2%). They improve organ and enzyme function, lower blood cholesterol and act as anti-inflammatory agents and stabilize against rancidity.